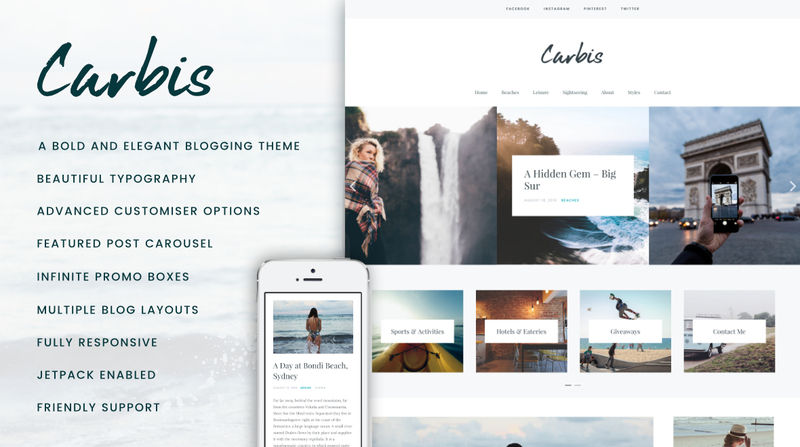 Carbis is a stunning blogging WordPress theme, with a bold yet elegant design - perfect for blogger’s to document their stories and adventures with the aid of beautiful typography and the abundance of space for large scale images and galleries. The full width, eye-catching featured posts carousel and infinite promotional content boxes will be sure to attract your visitors attention. Keep them hooked by chopping and changing the layout of your blog throughout your website, or alter the look of each of your posts individually to either display or not display the sidebar. As well as different layouts, Carbis has many other customization options too, including changing the typography, changing colors, toggling which elements you want to display…plus much more! Each element of Carbis is fully responsive, so whether you are viewing Carbis on your desktop computer, tablet or mobile phone, the theme will accommodate to suit the screen size perfectly. Carbis is also JetPack ready with JetPack specific widgets, galleries, related posts, infinite scroll and more! Infinite content boxes - add as many content boxes as you need. Once you have purchased Carbis and activated your theme license, you will get updates delivered right to your WordPress dashboard. This makes updating Carbis a breeze, all it takes is one click. If you need support, please don’t hesitate to leave us a ticket at https://sculptureqode.ticksy.com and we will get back to you as soon as possible. Please be aware that we are from the UK so do take timezone differences into consideration when waiting for a response! Thank you for taking the time to check out Carbis. If you have any questions, comments or suggestions about our theme, we would be more than happy to hear from you.